Mono Vampire have won the Fiba Asia Champions Cup SEABA Qualifier. They rallied past Pelita Jaya in the decisive game tonight. Jason Brickman (181-PG-91, college: LIU Brooklyn) scored 23 points and handed out 12 assists to lead the winners. Mono Vampire posted a 26:23 lead after the opening frame. They unleashed 34 points in the second term to boost the lead at 16 points at halftime. Mono Vampire kept Pelita Jaya at bay throughout the second half and rallied to a comfortable win. Darongphan Apiromwilaichai (185-G-85) provided 19 points, while Michael Singletary (198-F-88, college: Texas Tech) added 17 points and 14 rebounds in the victory. 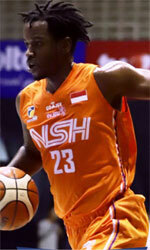 Jaleel Roberts (213-C-92, college: NC-Asheville) replied with 21 points and 8 rebounds for Pelita Jaya.